As many of you know, Alpha College of English is situated in the heart of Dublin city centre. Here at Alpha we encourage all of our students to immerse themselves in Irish culture, and pride ourselves on the cultural and social programmes we provide. We recognise that students need to get out of the classroom, and our social programmes are the perfect chance to do so! Dublin and its surrounding areas are steeped in history, therefore you will find there is an endless list of museums, sites, galleries and events to explore. Alpha makes this exploration easy for all by offering excursions and activities to places of social, cultural and historical significance, at no extra cost. 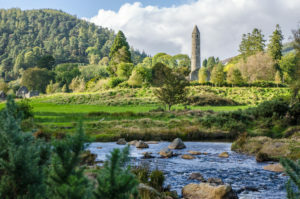 One of our many destinations: the picturesque round tower of the ruins of the Monastery of Glendalough Ireland during an Autumn day, with a river running in the foreground. The next few months at Alpha are jam-packed with interesting and exciting activities as we move into the Spring and Summer months. All students can attend our meet-ups, activities and excursions to practise their spoken English, develop their vocabularies, and moreover to have fun with fellow students. First up, every Friday we host a social night, which is led by one of the Alpha teachers. The social night usually takes place in a traditional Irish pub. This is a truly great opportunity for people to unwind after a hectic week of learning. It also allows them to immerse themselves in Irish culture while practising English. The venue changes week to week, and groups meet at 9 pm on Fridays. The evening usually draws to a close around 11:30, however students are free to continue the party for as long as they want! 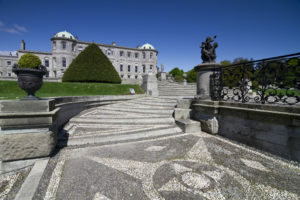 Built in 1731, the Powerscourt House estate is situated on the site of a Norman castle. Join our excursion to Powerscourt to find out more about its history! A large part of our activities focus on Irish history, culture and society. In particular, we offer trips to famous landmarks, museums, galleries and workshops as part of our social programme. This provides students with informative tours, a background of the country they are living and learning in, and as a result a lasting impression of Irish history and culture. In addition, we offer excursions on Saturdays, for those interested in visiting scenic places of interest. Our Saturday excursions from September to June are places within Dublin, and in July and August our tour groups venture further afield. We have a lot of locations to visit over the coming months and, of course, would love for as many people as possible to take part! Our destinations are integral parts of Irish history and society, therefore we offer a wide variety of places to visit. For example, we will be taking students to the iconic Croke Park; the Phoenix Park, home to deer, Dublin Zoo and our President Michael D Higgins; the sprawling 19.5 hectare National Botanic Gardens in Glasnevin; Speaker William Connolly’s Palladian utopia Castletown House; and the picturesque monastic settlement Glendalough. With various counties, locations and sites to visit, our tours and excursions are not to be missed! A view of William Connolly’s Castletown House in Co. Kildare from its front lawns. With so many places to visit, and so much of Ireland to see, how could you say no to these free excursions and activities? If you are interested in booking a place on one of our courses and participating in our wide range of excursions and tours please visit here to view our General Courses. Visit all of these amazing places and take our English courses at reduced rates as part of our special offer. If you take part in our excursions don’t forget to share your experiences and photos on our Instagram and Facebook pages!